As new technologies are being implemented across the sectors, the notion of IoT is striding towards hospitality industry as well. For a chain of restaurants, with the growing number of outlets there is a strong need to network their operations to a central facility. WebNMS offers an end-to-end solution for the hospitality industry, from monitoring kitchen appliances to building management to delivery tracking. This complete solution will be the first of its kind in the hospitality industry. WebNMS’s highly scalable IoT Platform coupled with rich set of APIs (focused on energy monitoring, remote asset management, and location tracking) and ‘open approach’ which makes it a perfect ingredient for the hospitality industry! What seemed daunting for the industry to adopt technology with its complexity in integrating multiple software/hardware and higher implementation cost, WebNMS IoT Platform has simplified the path allowing them to focus only on their craft while ensuring seamless transition. WebNMS IoT solutions’ economy of scale makes it affordable even for a small chain of restaurants and not just the luxury brands. The Platform helps them to tackle enormous challenges in energy consumption, water consumption, food wastage, inventory management, customer service, and facilitate to boost profit. On an average, a restaurant outlet can save up to 20-30% on energy. As consumers are becoming tech-savvy, time has come for the business to be on the leading edge. WebNMS enables the customer to keep tracking their ordered food in real-time similar to the Uber or Ola apps. The system also improves staff efficiency by raising an alert when the delivery person takes a longer route or deviates from the destined path. In an industry where delivery time is crucial, faster and fresher food ensures a happy customer. The IoT solution also enables the managers to keep track of the inventory in transit. For instance, when a restaurant manufactures the confectionery in a separate outlet and it has to be distributed in all of its branches in a city. The Google-map based real-time visibility of the logistics eliminates driver negligence and improves efficiency by on time dispatch. Further, the quality of food is kept under check by monitoring the temperature of the truck in real-time. Energy and water accounts for huge chunk of operating expenditure in a hospitality industry. The IoT solution enables restaurant to save on utility bills. Additionally, the health of an air conditioner, diesel generator, and other appliances (including refrigeration, kitchen display, oven, dish washers, and more) are monitored for predictive maintenance. Technology innovations are boundless with WebNMS, right from digital menu board and real-time streaming dashboards in a restaurant. In the long term, the data from table-side ordering give deep insights on customer behavior and ordering pattern. 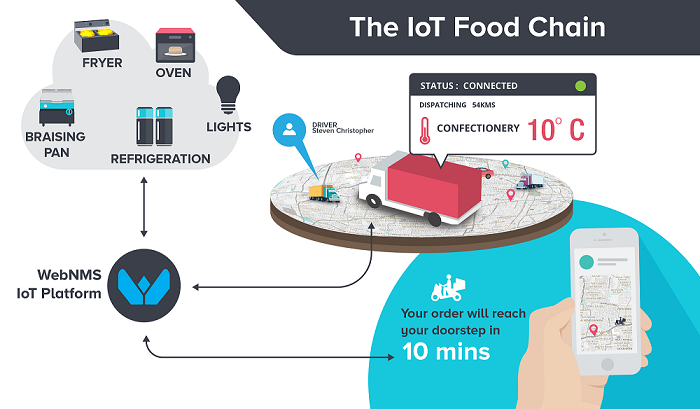 Now even chefs can jump onto the IoT bandwagon by switching on the fryers and oven from their iPhone, and more! !